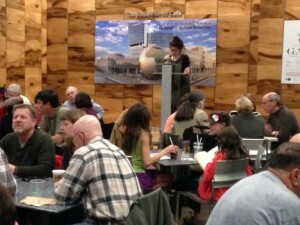 The North Carolina Museum of Natural Sciences has Trivia Night events the first Thursday of each month, which draw both adults and teens. These events are fun and lively ways to bring people together around science. The flow of the evening is thus: To begin, attendees must form teams of less than 8 people to play the game. Teams select a name and the players are encouraged to be creative. Some of the names are really funny! Trivia Night with adults. Announcer calls out the questions and the groups brainstorm their answers. Our games consist of thirty questions and teams record their answers on a sheet. We have an announcer with a microphone so everyone can hear the questions clearly. To mix things up, we include two visual questions, like “what animal is this?” or “what doesn’t belong?,” where three pictures somehow belong together and the fourth doesn’t. The other 28 questions come from all kinds of places. We get ideas from social media stories, government websites like NASA or NOAA, current science events, science fiction, etc. We always include a 31st question as a tie breaker question. The tie breaker is always a quantitative question, like “What is the weight in pounds of the heaviest recorded pumpkin in US history?”. If there is a tie, the closest answer to the correct number wins. Our games deliberately do not have themes: we feel that we might discourage too many people if the subject matter is too narrow. Plus, it makes it easier to find questions when you have a variety of topics to choose from. The game is divided into three segments of ten questions and lasts about an hour and a half. After the first round of 10 questions the team names are collected and before the next round starts the names are read out loud. This usually is very fun and gets the group energized. Then we do the next ten questions, and after that people get food. After the final round, we have the teams grade each other’s answers. We then collect the sheets and give out prizes for first and second place winners. Teens answer trivia questions during social time before the Café presentation begins. 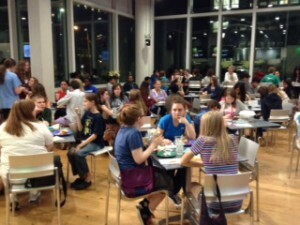 In our NC Open Minds Teen Cafés, we have included trivia type questions in the scientist’s presentation. This helped keep the kids attention on the subject matter, but it wasn’t really like a trivia contest. A Trivia Night needs to stand on its own, but you could have an occasional Teen Cafe consist entirely of a Trivia Night, which can make for delightful variety in the program. Our trivia contests are very popular: we often get more than 100 people coming to Trivia Nights!